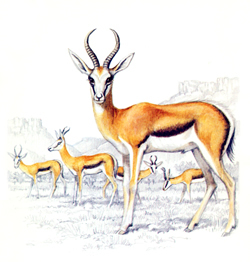 This species has adapted to the dry, barren areas and open grass plains and is thus found especially in the Free State and North West Province, and in the Karoo up to the west coast. They move in small herds during winter, but often crowd together in bigger herds in summer. They breed throughout the year and lambs are born after a six-month gestation period.